Every day thousands of us enter into agreements with other individuals and companies that enable us to buy goods, obtain loans and mortgages, and allow us to use the utilities of big name companies on the basis of agreed credit. As a result of this every day thousands of us find ourselves completely out of our depth with no understanding as to the whys and the wherefores of the contracts and agreements we have entered into. Why Should I Read the Small Print? When you enter into an agreement with a company or organisation there will nearly always be a clause contained within the small print on the reverse of the agreement that will ensure that company makes money. These are sometimes referred to as the hidden clauses or the catches and that is indeed what they are and unless you, or someone acting on your behalf, reads the small print there is a good chance that you may find yourself out of pocket; or in an even more extreme case, out of a home. What is Small Print For? Small print contracts or agreements (normally found on the reverse of the documents you are signing) are designed to act as a way of passing on vital information to you from a company or organisation without them actually having to read it to you. However this in itself has many drawbacks, the main one being that many people do not read the small print so the company is automatically on the winning side of the fence because the individual has signed their name to something without fully understanding what it says. Do the Contents of the Small Print Benefit Me? If you research the contents of the agreement – or have someone do it for you – then you may well find a clause that would be beneficial to you should there be a problem. However, as we have already mentioned, most of the clauses contained within these agreements are designed to ensure that the companies involved do not lose out on the money they have lent to you and in some cases it ensures they receive even more by way of compensation. Many small print clauses will document how the company has the legal right to take back any goods you are renting or leasing from them whilst still being liable for monies outstanding to you. This is the same with mortgage agreements which – when you read or have the small print read to you – will document how the level of interest will still accrue even after the mortgage has been defaulted on. 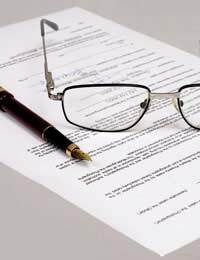 What Should I Do Before Signing an Agreement? Take the time to read the agreement thoroughly and make a list of questions to ask about points which you are unclear about. If you are in any doubt ask a family member or friend to look the agreement over for you or make contact with one of the organisations designed to help the consumer such as Citizens Advice. The most important thing you should do before signing an agreement is wait until you are ready to do so. This is best only after you have had any grey areas explained and any questions you have answered – if the company or organisation you are dealing with are genuinely interested in your custom then they will wait until you have satisfied your own curiosity and indeed will try to help you where possible.